Our robust storage units are 100% manufactured in our Melbourne factory – designed to handle years of trouble-free regular usage in the toughest conditions. Can you find what you need quickly when you’re out on the job, or are you constantly searching around for where you put your tools and gear in the back of your ride? 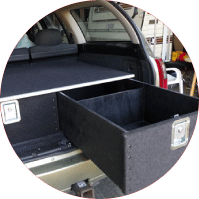 Best Off Road are Australia’s leading supplier of customised ute storage drawers, van drawers systems and 4WD drawers, the best value heavy-duty Australian-made units you can get. . Whether you’re a hard-working tradie or a family heading off camping or travelling, clean up your vehicle and get super-efficient with our high-quality storage solutions. 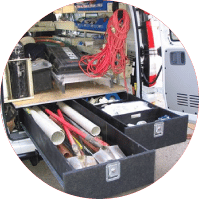 If you can’t find the right design from our extensive range of units, we will custom-design storage to precisely fit your vehicle and unique needs. Sounds expensive? Surprisingly, our customised units are great value, often costing no more than our standard range. You get exactly what you need without breaking the bank. Our high-quality custom ute drawers systems maximise your space and make your work day easier. Meet all your on-the-road storage needs with our popular van drawers systems, which we can customise for any style of van. 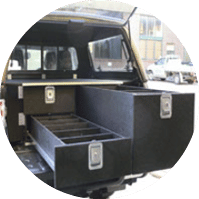 Our strong, super-light 4WD drawer systems are customised to exactly fit your vehicle, attaching to its existing anchor points to save you valuable space. Fit your vehicle with heavy-duty Australian-made custom storage. Fantastic job to install the drawers to my requirements! Jim, Steven & Jenny will look after you. It certainly is the BEST. Always great quality! And service is outstanding! Great product great price and good service. Great product and great guys to deal with. Wouldn’t take my work vehicles anywhere else. These guys are good to deal with and are always efficient with delivery & time frames. Highly recommend Best Off Road for good price & product. The drawers for my Pajero were custom made to take my tools and heavy battery pack. Thanks Jim, I’d recommend you to anyone.